Old Blue Mountain (left) and Elephant Mountain (right). The next Maine A.T. Land Trust hike will be up Old Blue Mountain (3,600 feet) from South Arm Road in Roxbury on June 11th at 10am. This will be our hike for National Trails Day! 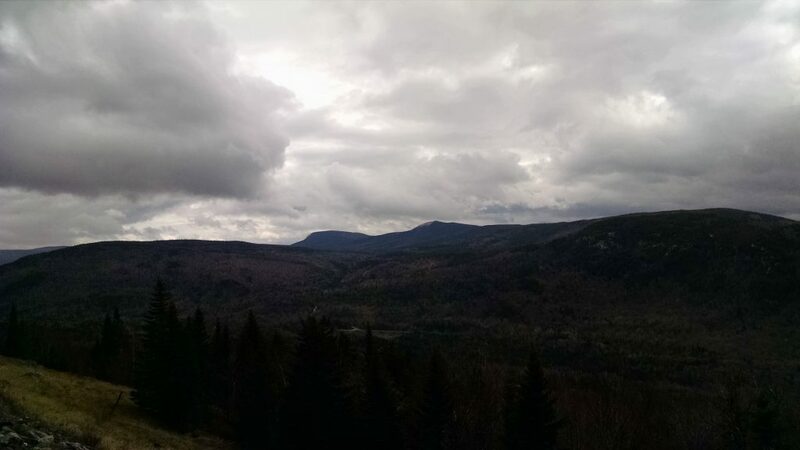 To reach the trailhead in Black Brook Notch, drive east on Route 120 out of Andover, and then take a left on South Arm Road approximately a half mile outside of town. Go 7.7 miles north on South Arm Road to reach the Appalachian Trail crossing. There is a small area on the right side of the road that has parking for 3-4 cars, so we will be car pooling. That information will be sent out if you RSVP. The hike is only 2.8 miles to the summit of Old Blue from the parking area, but the initial ascent out of Black Brook Notch is very steep. There are rungs on the rocks in one area, but after this initial climb of 900 feet in just over a half a mile, the trail level become more gradual for another mile and a half. The final half mile is again steep to reach the summit of Old Blue where there are good views in all directions among the stunted spruces. The estimated time for this hike is 5 hours total (up and back) over a distance of 5.6 miles (up and back). You must RSVP for this hike so we can rideshare and in case of cancellation due to weather or other circumstances. We are also going to be providing some food so we need an accurate headcount! To RSVP, please enter your name and email in the RSVP space below. You can also email us at info@matlt.org or call us at 207-808-2073. This should be a great hike! Come along!